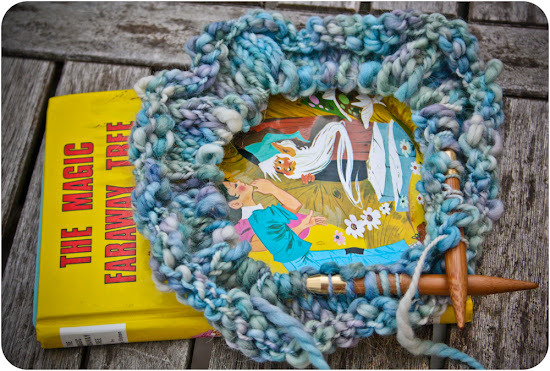 I'm joining Ginny for Yarn Along again today, and we're still reading The Magic Faraway Tree. 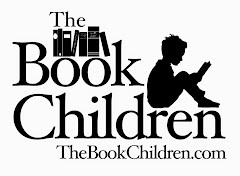 The story is so sweet and funny, a perfect mix of magical, silly, and 40s-era language that I just love. I just started a little hat for a friend. I haven't gotten very far, and frankly, I've been in less of a knitting mood since the weather warmed. I keep finding sewing projects that I want to start though! Even though the lighting in here is horrible due to lack of windows, I wanted to get a few shots. This bathroom has been in sore need of a little makeover. 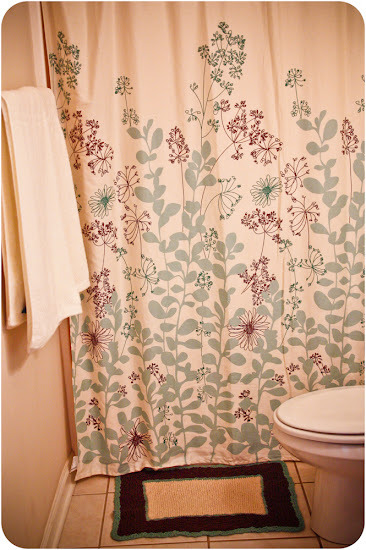 I had a gift card to Home Goods where I found this shower curtain, a few new ivory towels, and a espresso brown cotton rug to go in front of the sink. What I couldn't find was a little bathmat that matched the curtain. 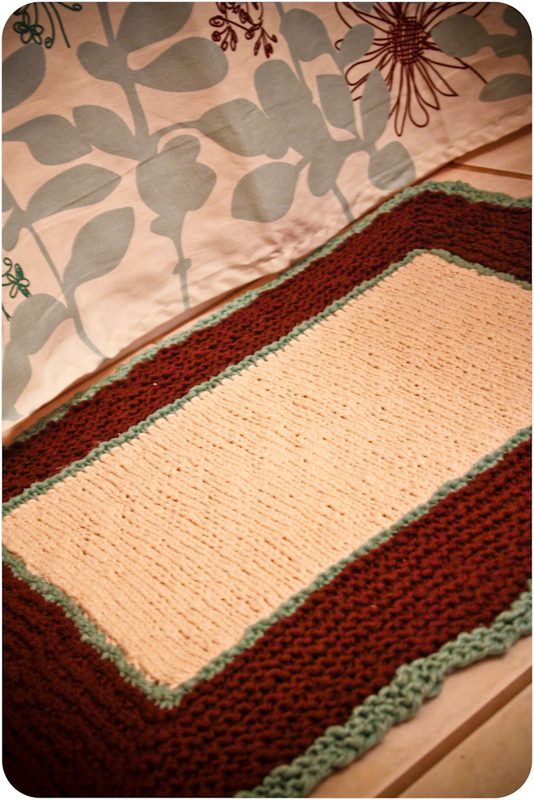 I did find a little bath mat pattern at the Purl Bee that seemed like it would be a perfect fit in this little spot. I blindly picked colors from the new Knit Picks line of bulky weight pima cotton yarn and amazingly the colors matched almost exactly. 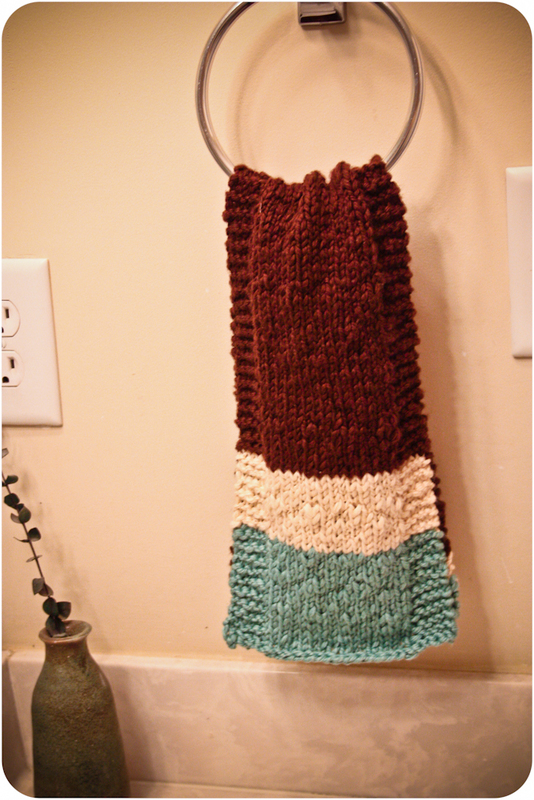 With the leftover yarn from the bathmat, I even made a matching hand towel (no pattern, just stockinette with a garter border). Spring seems all the nicer when you spruce up a few spots in the house. Love!!! The mat and towel were meant to be with that beautiful curtain :) I have a desire to revamp my bathrooms now. You are very creative! Love your little bath mat and the towel....they turned out great! It's so satisfying to make such useful things! What a beautiful makeover! I think brightening up those little spots in a home give a good feeling to the whole house! I love your color choices. I have very similar in my bedroom. I used to have that very same book when I was little! The yarn for your hat is wonderful. Your bathroom is looking amazing and the mat is wonderful!!! 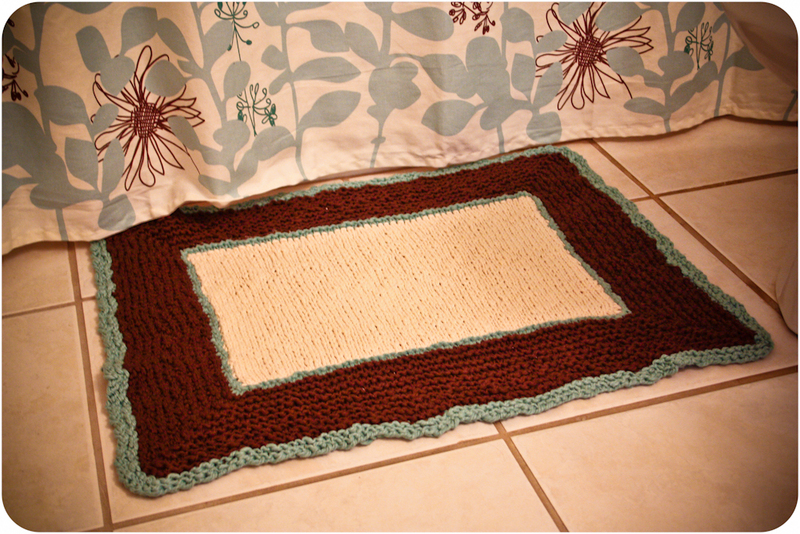 Bath mat and matching towel are wonderful, they go so perfectly with the shower curtain. I loved the Magic Faraway Tree when I was younger. My boys don't like me reading to them in english which makes me quite sad as I feel like they are missing out on my childhood classics. My mother in law has given me my husbands old french story books but it's not quite the same! Fantastic - I love the bath mat and matching towel! Oh, your bath mat is gorgeous! Perfect colour matches, too. Thanks for sharing. The bath mat is beautiful!